Few paintings by Angelico are as jewel-like in scale or in delicacy of execution as this miniaturist treatment of a common devotional theme. The artist has portrayed the Virgin not as the enthroned Queen of Heaven or the Madonna of Humility but with a greater naturalistic immediacy, seated on an unadorned stone bench. She holds a beautifully painted rose and spray of leaves in her right hand, and with her left hand supports the Christ Child, who stands on her lap. Her head inclines very slightly toward her son, although her eyes are trained steadily on the viewer, while the Child, holding an orb symbolic of earthly authority and raising his right hand in a gesture of blessing, gazes distractedly out of the picture to the left. One of the four angels standing behind the bench, his hands joined in reverence, seems to be following the direction of the Christ Child's gaze, and another, just visible immediately behind the Child's halo, appears to be turning his eyes and his head to that side as well. The two angels at the far left and far right stare raptly at the Virgin. The original function of the Detroit Virgin and Child is not known, although it may be half of a diptych or part of the wing of a small portable triptych; more likely, however, is that it is complete in its present form, except for the loss of its engaged frame.Three other panels by Fra Angelico portraying the Virgin and Child with angels, all intimate in scale yet not as small as this one, also appear to have been conceived as independent works rather than as parts of a larger complex. The earliest of these (fig. 55), showing theVirgin enthroned beneath an elaborate marble canopy and adored by a ring of twelve angels (Stadelsches Kunstinstitut, Frankfurt), dates from approximately the time of the San Domenico high altarpiece: probably about 1420 or 1421. Like that altarpiece, it is still essentially Late Gothic in tenor, but a number of progressive spatial devices prefigure the development of Angelico's style through that decade. In a somewhat later version in the Pinacoteca Vaticana (fig. 91), dating to the mid- or late 1430s, the carved baldachin of the Frankfurt painting is replaced with a gilt cloth of honor, which stretches across the back of the entire composition. The Virgin is more monumental in scale in relation to the tightly compressed crowd of angels at either side, and two kneeling figures of Saints Dominic and Catherine of Alexandria are introduced in the foreground. In the artist's final version of the theme, probably painted in 1447 (Museum of Fine Arts, Boston; cat. 36), the format of a major sacra conversazione altarpiece has been adapted to the reduced scale of a domestic furnishing. While these three paintings might be viewed as maturing solutions to a single artistic problem, none of them pretends to the emotional intimacy of the Detroit panel, and it is difficult to consider that work as part of a series with them. The few scholars to have written about the Detroit Virgin and Child since it first came to public attention in 1956 have been unanimous in considering it among Angelico's early works and proposing a date ranging from the 1420s to as late as 1432. (*1) Umberto Baldini associated it stylistically with the San Pier Martire triptych (see cat. 13), which he regarded as one of the artist's earliest paintings. (*2) The structural solidity of the figures in the Detroit panel and their sophisticated psychological interaction argue for an even later date, however — closer to the execution of the Saint Lucy predella (cat. 25), dated here about 1429 or 1430, or the Saint Francis predella (cat. 24) of perhaps a year earlier. 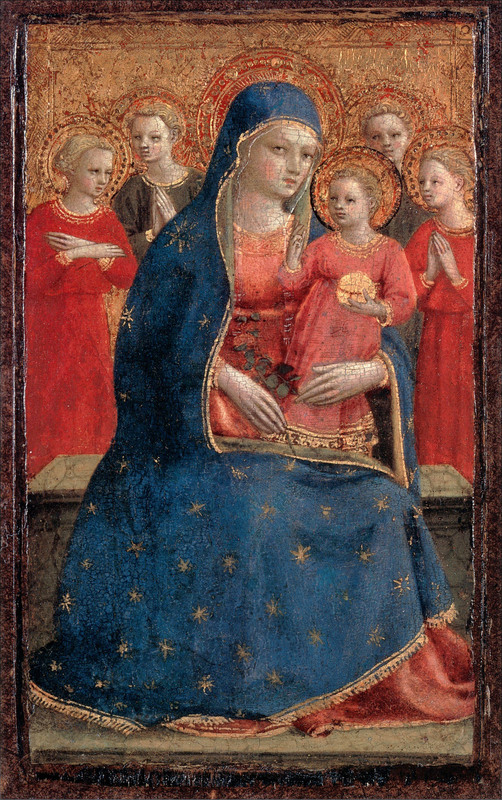 Exact parallels for the style, for the poses of the figures, and (although on a more elaborate scale) for the spatial structure of the Detroit Virgin are to be found in the Coronation of the Virgin reliquary from Santa Maria Novella — the second of four reliquaries that, according to Richa, were painted by Angelico for Fra Giovanni Masi (see cat. 28). This painting, too, can be dated by inference only, but like the Detroit panel it must immediately precede the Saint Francis predella, and probably was executed about 1427 or 1428.A date of about 1427 for the present painting seems the most plausible. (*1). Richardson 1,955-56, pp. 86-88; Berti 1963, p. 38 n. 102; Orlandi 1964. pp. 14-15; Pope-Hennessy 1974, p. 223; Boskovits 1976a, p. 31; Boskovits 1976b, p. 39; Bonsanti 1998, p. 121. (*2). Baldini 1970, p. 86.